MEDFORD, OR--(Marketwired - Oct 16, 2013) - Harry & David, America's iconic gourmet gifting curator, is proud to announce the introduction of an all-new collection of wines for 2013. The company, which has recognized the popularity of premium wine gifts, today announces its new wine portfolio for this season. Harry & David's 2013 wine collection presents a chance for customers to enjoy a diverse assortment of first-rate expressions. To achieve this, the brand is partnering with expert winemaker Linda Donovan of Pallet Wine Company. Every ounce of Harry & David™ wine originates from Oregon, a state that has developed a great reputation in the wine community for its ability to produce magnificent grapes. The warm days and cool nights in Oregon are ideal for the maturation process of grapes, and Harry & David has helped highlight the presence of wine production in an area traditionally known for its outstanding pears. In 2012, Harry & David established itself as a winery and undertook a soft launch with a limited offering of wine. 2013 presented an opportunity for Harry & David to broaden its wine business by overseeing the development process from harvest to bottle. "We recognized the desire for premium wine gifts, so it was a natural progression for us to launch this year's exceptional wine portfolio," said Craig Johnson, CEO of Harry & David. "As the number one gift curator in the country, we're proud to offer customers the unique opportunity to toast celebrations with wine that is grown and produced right here in Oregon. At Harry & David, we relish the opportunity to expand our role in the already burgeoning Oregon wine community and draw additional awareness to phenomenal Southern Oregon wines." Bold berry notes and herbal nuances make this a smooth, full bodied red. Oregon grapes lend themselves to this lush and structured wine. Beginning with cherry and cedar aromas, notes of vanilla and blackberry begin to arise in this robust red wine with a balanced finish. This wine pairs perfectly with an antipasto plate, grilled vegetables and meats, prime rib or a rich mushroom pâte. Retail price: $19.95. A balanced blend with smooth fruit flavors and subtle undertones of vanilla and cedar, this lush red wine blend represents the best of Southern Oregon. Brimming with cherry, blackberry and cola nut notes and balanced with spice and structure, Royal Crest Red presents a medium body and a bright finish. This wine complements red meats like steak and lamb, stews, cheese and dishes with rich sauces or mushrooms. Retail price: $19.95. Exquisite and full of delicious aromas, this sublime wine is made from the white Muscat grape. Lively, light bodied and with nuances of apricot, grapefruit and melon, Harry & David's Moscato makes for a refreshing and radiant white with good balance and the alluring scent of honeydew and citrus. This wine is excellent as an aperitif or paired with fruit, charcuterie, cheese courses, antipasto plates and desserts. Retail price: $14.95. Pinot Noir is the wine Oregon is known for. Although the grapes are notoriously difficult to grow, Pinot Noir is always tremendously rewarding to drink. Harry & David's take on this Oregon specialty is a light and refreshing red with bright raspberry and rhubarb notes with a balanced finish. Reminiscent of sweet red berries and full of flavor complexity, this garnet-colored red has low tannins and a light juiciness. This wine is an excellent match for lean meats, poultry, pork, lamb and dishes with mushrooms. Retail price: $19.95. Tremendously versatile, this dry white wine is medium bodied and has honey and melon notes and a soft, clean finish. Enormously popular, and for good reason, Chardonnay is made from vigorous vine grapes that adapt readily to their environment. After aging in stainless steel and neutral oak barrels, this divine white wine develops a lush mouth feel and finesse. This wine enhances seafood, poultry dishes, pork, creamy soups and dishes with heavy cream sauces. Retail price: $14.95. Harry & David's entire 2013 wine portfolio is available online at www.harryanddavid.com in a number of formats. Customers can purchase wine as a collection of two to three bottles, or receive pre-paired wine with many of Harry & David's most popular gift options. Additionally, Harry & David has created an add-on program where customers can select a wine to add to a selection of gifts, including gift baskets and chocolates. Harry & David is America's largest multi-channel marketer of gourmet premium fruit gifts, fine chocolates, baked goods and confections, and carries many home décor accessories as well. For the latest deals and specials from Harry & David, join our Facebook fan page, Facebook.com/HarryandDavid, or visit www.HarryandDavid.com. 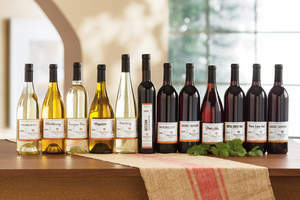 Visit HarryandDavid.com for further details and restrictions relating to the purchase of wine, and a list of states to which Harry & David wine can be shipped. You must be 21 years of age or older to order, purchase or received delivery of wine.